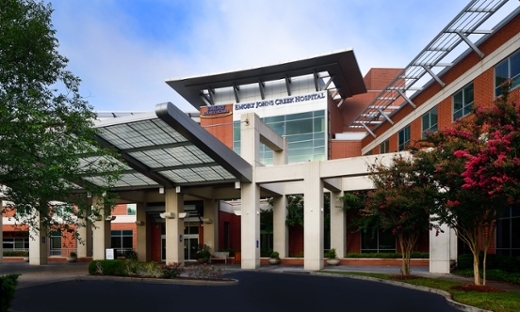 A new Emory Clinic Vascular Surgery office and Vein Center is now open at Emory Johns Creek Hospital (EJCH). The office located at 6335 Hospital Parkway, Suite 203 in Physician's Plaza at EJCH includes five Emory Clinic vascular surgeons specializing in the treatment of patients with arterial and venous diseases using minimally invasive techniques. This includes a variety of common health issues such as peripheral arterial disease, aortic aneurysm repair and varicose vein treatment. The Emory Clinic vascular surgeons practicing at the new location are: Michael Clark, MD; Charles Lewinstein, MD; Mark Mittenthal, MD; J. Mark Rheudasil, MD; and Joseph Zarge, MD. "We're excited to bring our talented team of vascular surgeons to Johns Creek to provide outstanding patient care and better serve the healthcare needs of people in this city," says William D. Jordan, Jr., MD, professor of surgery and chief of the Division of Vascular Surgery and Endovascular Therapy, Department of Surgery, Emory University School of Medicine. "As part of one of the leading investigative centers in the world, these Emory surgical specialists are delivering top-rate care, helping pioneer innovative clinical research and are often involved with developing and refining the cutting edge procedures they perform," says Jordan. The Emory Clinic Vascular Surgery Office and Vein Center at EJCH will offer a diverse menu of services including: peripheral venous and peripheral arterial ultrasound, cerebral ultrasound, aortic ultrasound, visceral ultrasound and dialysis access ultrasound. Physicians are able to perform vein ablations on-site under ultrasound guidance. The new Clinic also includes a full service vascular lab accredited by the Intersocietal Accreditation Commission and has a registered vascular technologist on staff. Emory Clinic Vascular Surgery and Vein Center at EJCH is open 8:30 a.m. – 5 p.m., Monday through Friday. For more information, call 678-843-5400.